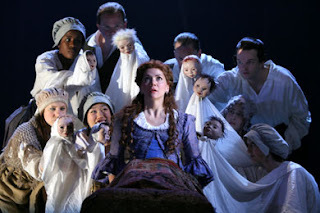 "Coram Boy": Best Dead Baby Musical? Another British import bites the dust this weekend. The National Theatre's "Coram Boy" closes tomorrow, Sunday. My own reaction to the show was peculiarly mixed. On one hand, as an admitted theatrical anglophile I found myself transported to some of that epic Trevor Nunn-"Nicholas Nickleby" spirit that stirred me as a teen playgoer. It's Nunn-lite, definitely, but some bold master strokes create a stage magic not to be found anywhere else in NY at the moment. (There's an underwater sequence in Act II that people who've seen it know what I mean.) Also the cast of 40 and the live bewigged pit musicians give everything a refreshing side. Then again, I found the first act totally baffling and preposterous. And the script annoyingly thin. By which I mean, as a literary adaptation, it takes the frustrating approach of just skimming the surface of an elaborate plot and only giving us enough dialogue to jump from one episode to the next--as opposed to showing us a little first about who these characters are and why we should care. (It doesn't surprise me the adaptation of this UK Young Adult novel is by Helen Edmundson of the Shared Experience company--whose "Passage to India" I saw at BAM a few years ago did the same rush job with a much meatier book.) So as the first act speeds through every little thing that happens in the story--with way too many inconsequential characters--it can be rough going. But Act II surprisingly gains some focus, zooms in on the few personages who count, and the direction goes for depth over breadth. Also, the cast is pretty consistently strong--especially Bill Camp and Jan Maxwell, reminding us that in any country they would be celebrated classical actors instead of what the Broadway audience calls, "who?" Then again, I found Brad Fleischer's grating stage-retard "Meshak" an awful miscalculation of a performance-- one I blame equally if not more so on director Melly Still-- aiming for the poignant simplicity of Nickleby's Smike but resulting more in a road production of "Boys Next Door." Too bad since the character is supposed to be pivotal. The disparate reactions to "Coram Boy" have been fascinating. It was huge in London--both at the National and the West End. But then Charles Isherwood summed up some of the problems of cultural translations by leading his unimpressed review with the blunt question: "What the heck is a 'Coram Boy'?" Pretty snide, eh? Still, he puts his finger on the mystery of why the producer's assumed a modest show with a strange title with no stars--not to mention huge overhead expenses--would last a week in today's Broadway market. The show's had its champions here, too, though, like David Cote who signed off, "It’s enough to turn you into a wonder-struck kid all over again." As soon as we put His Dark Materials on stage, we could see there was a huge demand for this stuff. It wasn't being done. So, finding those stories for that audience that takes its parents, rather than vice-versa, was what I was really keen on. Interesting phrase that, isn't it? "The audience that takes its parents." Or, young audience we should say. Not bringing grandpa to snore through Act II in his 3rd row aisle seat. So what can I recommend about it? Well, I'm sure cheap tix abound. And if you're stuck in the city this holiday weekend, and you're interested in literary adaptation or epic staging, it may well be worth your while to check out. Even as a lesson in what to do and what not to do. The direction-design does definitely offer some visual treats for patient spectators. I would have wished for even more of an eyeful and earful. But in today's impoverished Broadway, I'll take what I can get. i agree that the play starts off oddly with meshak and his odd characterization, which put me off from the very beginning. it was a great theatrical production though. thanks for the great review. As a young adult (and seemingly the target audience), I found "Coram Boy" over-the-top and laughable...especially the underwater scene. Jan Maxwell was wonderful but looked marooned on a sad set with a bunch of "actors." Unfortunately, it seems that Melly Still never saw young guys horsing around. I don't ever remember jumping on my friends' backs and rolling around on the ground, giggling the whole time. And let's not even talk about the moaning trees or the heart-wrenching scene where Lord Ashbrook almost smashes his son's hands as the latter boldy and passsionately defies him by continuing to play music in the house. I consider myself a "sophisticated" theatregoer, and I was deeply moved by the fairy-tale like stoytelling. It reached into the most primitive parts of me -- the part that longs for the intensity of childhood hatreds and loves, and the desire to be a part of a family. Wonderful wonderful production.